Note: Spar deck vessel with 3 compartments; 5 watertight bulkheads; wooden sheathing on iron bottom. 20, 20, 40 & 40 x 36", 550 hp @ 72 rpm double steeple compound engine built by King Iron Works, 1873. Sister ships: JAVA, CUBA, RUSSIA. Built to operate Buffalo, NY, to Lake Michigan for New York Central Railroad. 1886 Sunk schooner S.J. TILDEN, St. Clair River, Port Huron, MI. 1899 Owned Western Transit Co. (New York Central). 1901 One 10' x 18', 90# steam, stotch boiler built by Farrar & Trefts, Buffalo. 1904 Owned Great Lakes Engineering Works. 1904, Oct 29 Owned Michael Galvin, Buffalo, NY. 1906, Apr Owned Jacques & Co., Montreal, QUE; C121784. 1907 Owned Montreal & Lake Superior Line. 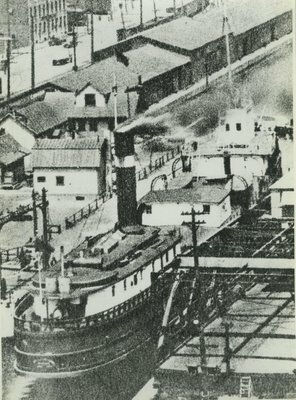 1930 Owned Canada Steam Ship Lines Ltd, Montreal; 222 x 34 x 25 1/2; 1515 gross / 864 net tons.